The remains of this stone circle can be found about half a mile South of Shap, on the Western side of the railway embankment. The stones can just be seen from the road....but there isn't any parking nearby. 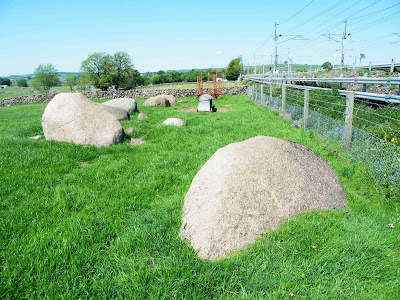 I would recommend parking back in Shap, and taking a walk to the field that these immense pink granite boulders now lie in. There are 6 large stones still remaining, with a number of smaller stones between the larger ones. Only half of the circle now remains, with local tradition stating that the others still lay in their original positions under the railway embankment. It appears that this stone circle was part of a much larger collection of circles, standing stones and avenues, some of which still survive today, hidden away in the corners of fields and gardens. Kemp Howe is variously known as Heppeshaw, Shapshaw and Shapsey. Check this website out. It has a huge amount of information on the stone circle, and the other circles and standing stones in the local area.